Sri Lanka is an island in the N Indian Ocean, off the southern coast of the Indian Subcontinent in S Asia. This large drop-shaped island enjoys a tropical climate and consists mainly of coastal plains, whereas the mountains are in the SC part of the island, rising up to 2,524 metres of elevation. The island receives rain and periodic squalls, and tropical cyclones sometimes sweep across these beautiful landscapes. Sri Lanka is a small country, but it is home to the highest biodiversity density in Asia. With numerous endemic species, as well among the flora as the fauna, several wildlife reserves allow to see a wide range of native flowers, mammals and birds. 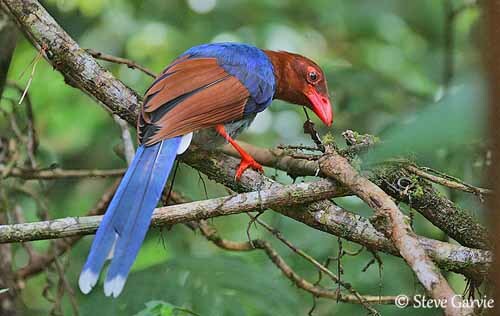 More than 430 bird species are living in Sri Lanka, with about 230 residents and among them, 26 endemic species according to the classification. Their distribution is mainly determined by climatic zones, and most of these endemic birds are confined to the wet and the hill zones, with a few extending into the dry area.